What is it about birds that so catch our fancy and delight our imagination? We live on a remote and relatively unpopulated area of Maine’s second largest island. The open space provides a number of wildlife habitats and is perfect for bird watching. We find sightings when we least expect them. If Bob is fortunate, he is able to quickly grab his ever present camera and snap some shots before the bird is out of range. My experience is more passive, watching the birds and feeling my soul soar through the skies with them. 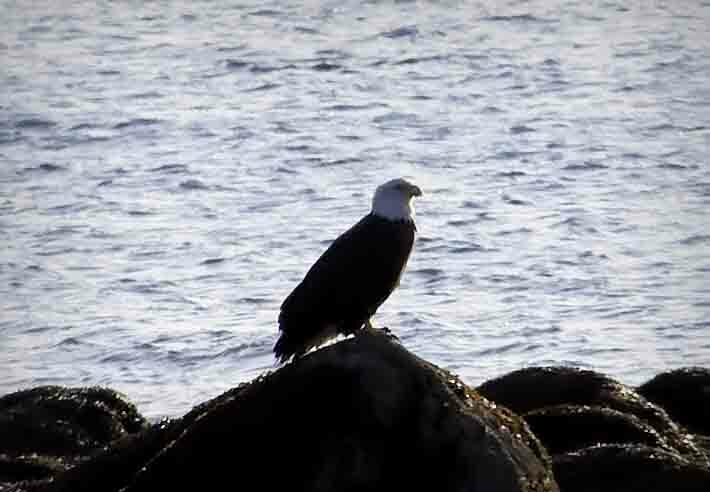 We frequently hear Bald Eagles on our land but have yet to see one although we have seen them soaring over areas near here and once saw a pair perched on the rocks near the causeway during low tide. The Bald Eagle is such a magnificent spectacle as it flies overhead, its brilliant white head and tail reflecting the light. Bald Eagles are found near large bodies of water and near old growth trees where they make their nests. They are excellent fishers and will swoop down over the ocean, grabbing a fish with their talons. Recently the Bald Eagle was taken off the endangered species list however islanders are still quite protective of these glorious symbols of royalty, power, independence, strength, and of our country. A couple of days ago we were chatting at home when a Barred Owl swooped down in the forest, grabbed a vole, and landed in the tree next to the bedroom window to consume his meal. 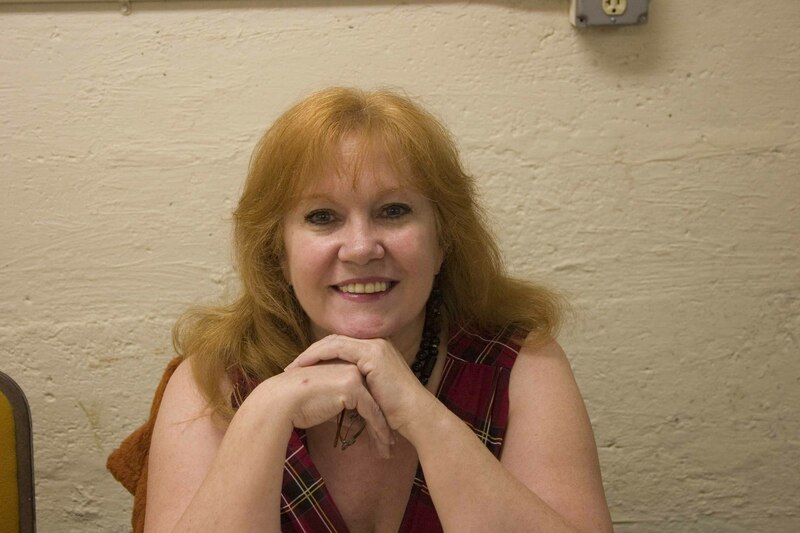 Bob raced down to the great room, quietly opened the door and snapped some pictures. Friends have told us they have lived here for 20 years and never seen a Barred Owl on their land. 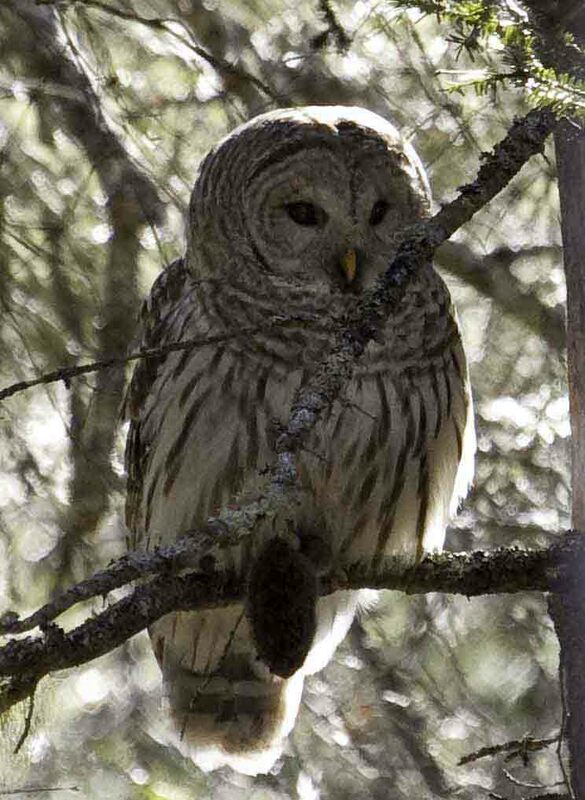 The Barred Owl lives in densely forested areas on the east coast and lives in tree cavities. Although like most owls it typically hunts at dawn or dusk, it may also hunt during cloudy days like the other day. We again saw the Barred Owl hunting in the forest near our garage. I hope that its nest is close and we can look forward to seeing it regularly. Owls are symbols of wisdom, being insightful and even mysticism. As one crosses over the causeway and rounds the bend, there is a tree that hangs a bit over the ocean. For several days we have seen a Red-tailed Hawk sleeping there. Bob parked alongside the road and tried to sneak up on him to take pictures. As if one could sneak up on a hawk! He took off and I found myself drawing a deep breath, amazed at its beauty. The Red-tailed Hawk is very common in the United States and is the most frequently used species in falconry. It and the Bald Eagle are sacred birds to many American Indian tribes. It symbolizes foresight, perception, lightness, being a messenger, and the sun. Another common hawk to the United States is found on Deer Isle. 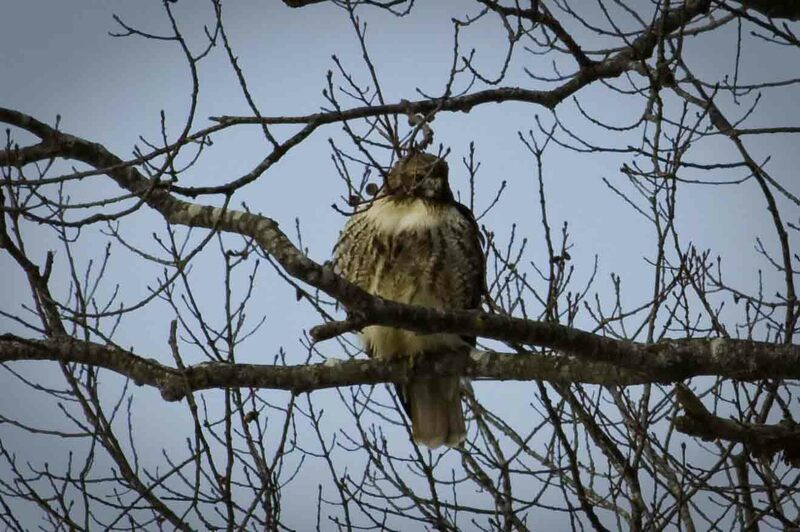 While taking a walk, Bob was able to capture a picture of a Rough-legged Hawk. 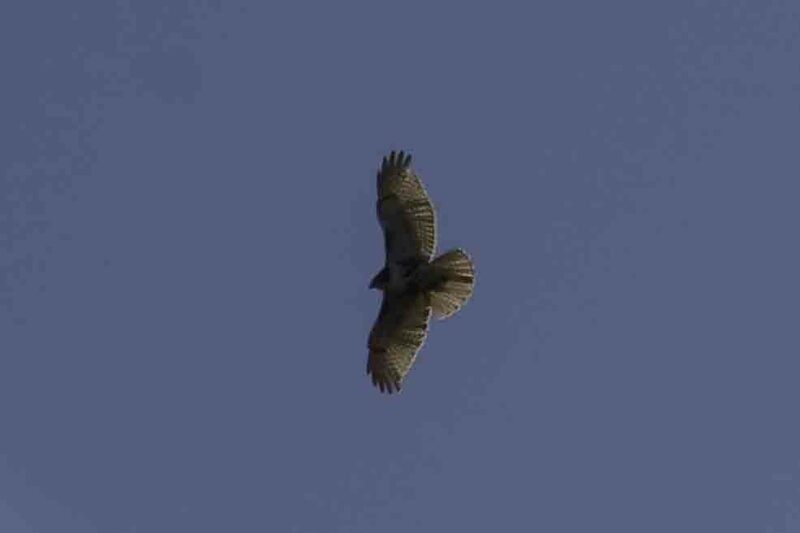 This large hawk is found in northern parts and breeds in conifer forests and even on the arctic tundra. It is said that sometimes in its nests one finds bones of caribou as well as sticks. Like the Bald Eagle, the Rough-legged Hawk has feathers all the way to its toes. The symbolism for this hawk is the same as others although it is especially known to symbolize watchfulness. 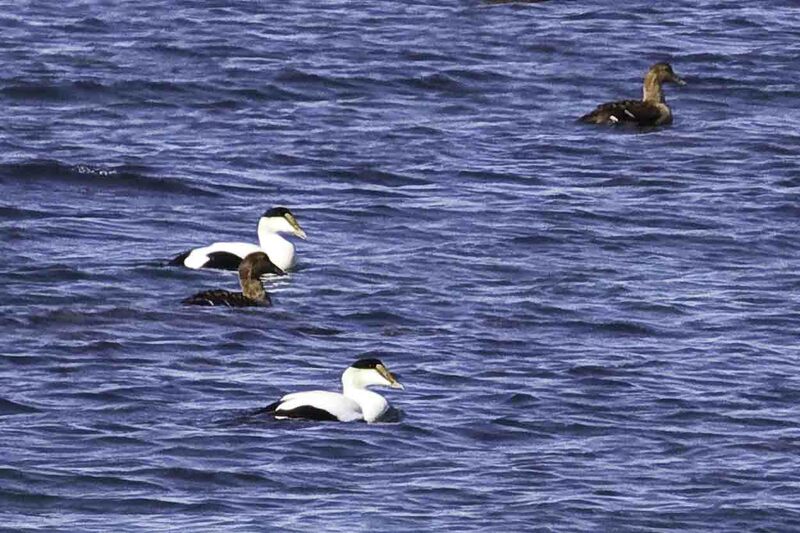 Whether or not bird watching is your hobby, there are plenty of opportunities to do so in the glorious wilderness of Deer Isle. This entry was posted in Retirement/Reinvention, Things to Do in Downeast Maine and tagged Bald Eagle, Barred Owl, best vacation, bird watching, birds, Bob Wilson photography, Coastal Maine, deer isle, Downeast Maine, Eider Ducks, family vacations, living, New England, photography, photos, Red-tailed hawk, Robert Wilson photography, Rough-legged Hawk, Shawn Phillips, vacation spots. Bookmark the permalink.